Small head diminishes fast. Grass and dough aroma. Weak, slightly spicy taste. Weak to medium body. Not really great. * Old rating. Many thanks to kevnic2008. Best before 08.04.11. Mild-süßliches, leicht würziges, sehr süffiges Bier. Mir zu süß. Kaum Herbe spürbar. Bottle @ weekly tasting shared by Dutchdrebus. Clear golden color, small white head. Smell and taste malts, lightly bitter, a hint of sweetness and dried fruit in the background. Decent body and carbonation. Bottle @ benzai. Clear yellow to amber colour with a small white head that doesn’t last. Smells sweet, malts, somewhat floral, fruity. Tastes sweet, malts, slightly fruity. Thin to medium body, soft to medium carbo. Flaske delt på dag 2, RBHD-samlingen hos Asle Bjørn: Klar, gylden med kort hvitt skum. Lett syrlig friskhet med en anelse maltsødme. 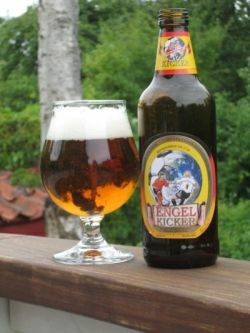 Pøseøl med skrukork for enkelhets skyld.Lite og kjedelig smak, et bevis på at alkohol og sport ikke hører sammen. Shared bottle during RBHD Mosterøl gathering. Clear golden body with a small white foamy head. Sugary leafy nose. Medium bodied. Bittersweet with a faint carboard prescence. Clear golden. Diminishing white head. Slightly fruity and malt sweet aroma with hints of continental hops. Decent, but bland, lager taste, with moderate bitterness. OK balance. Good drinkability. Shared 500 ml screwcap bottle at local tasting, from Getränke Hoffmann, Harrislee. Golden colour, moderate white head. Dull aroma, dust, pilsener wort and cooked vegetables. Medium sweetish flavour, alcohol is noticeable despite only 5.6%. "Dusty" hops. Could be better, could be worse. Bottle 50cl, a clear golden beer with good head. Nose is on corn sugar with wet paper notes. Aroma is on malt and bitter hops, toasted notes, bit sweet. Finish has light soap touch.